The first full rankings for the 2021 college football recruiting class just came out, and an Ohio State commit is right at the top of the list. Defensive end Jack Sawyer is ranked No. 2 overall in the nation according to 247 Sports. He’s the top-ranked prospect currently committed to a college. Sawyer committed to the Buckeyes in early February, giving Ryan Day a massive coup early in the 2021 cycle. Quarterback J.T. Tuimoloau from Sammamish, Washington is the only player rated ahead of Sawyer in the class. Tuimoloau is high school teammates with 2020 Ohio State WR commit Gee Scott. 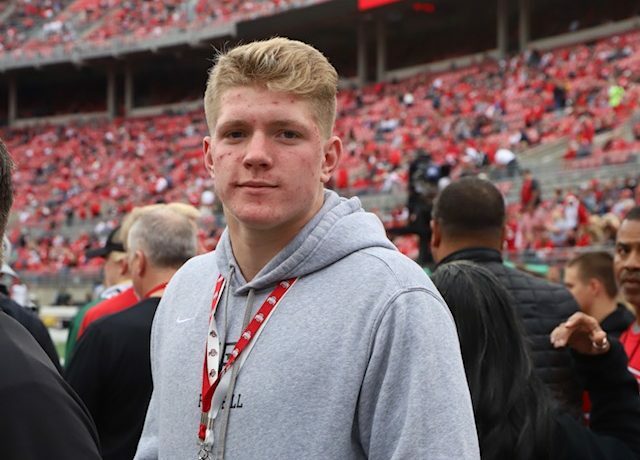 Sawyer is the only player currently committed to the Buckeyes’ 2021 class, but some other highly-ranked players could join him soon. Ohio State is considered a heavy favorite to land another in-state top-25 recruit. Offensive tackle Ben Christman from Revere High School is ranked as the No. 22 overall player in the class, and 3rd-best at his position. OSU offered him a scholarship earlier this spring. They are just part of what is shaping up to be a very strong year for football talent in the state of Ohio. A total of 18 players are ranked among the top-300 overall in the country for 2021. Just for comparison, only four players from Ohio are currently ranked as top-300 prospects in 2020. WR Lorenzo Styles, Jr. from Pickerington: The son of the former OSU linebacker, Styles is the No. 109 player nationally, and 15th-best at his position. WR Jayden Ballard from Massillon: He’s just behind Styles, as the No. 116 player overall, and 17th-best wide receiver. SAF A.J. Kirk from Dublin: The younger brother of former OSU all-American Michael Doss is the 5th-ranked safety and No. 171 player overall. The Buckeyes have not offered him a scholarship yet. RB Jaylen Anderson from Perry: He’s the 11th-best running back and No. 171 nationally, but does not yet hold an OSU offer. DE Najee Story from Solon: Story is the No. 15 DE and 184th-best player overall. The Buckeyes recruit from all over the nation, of course. 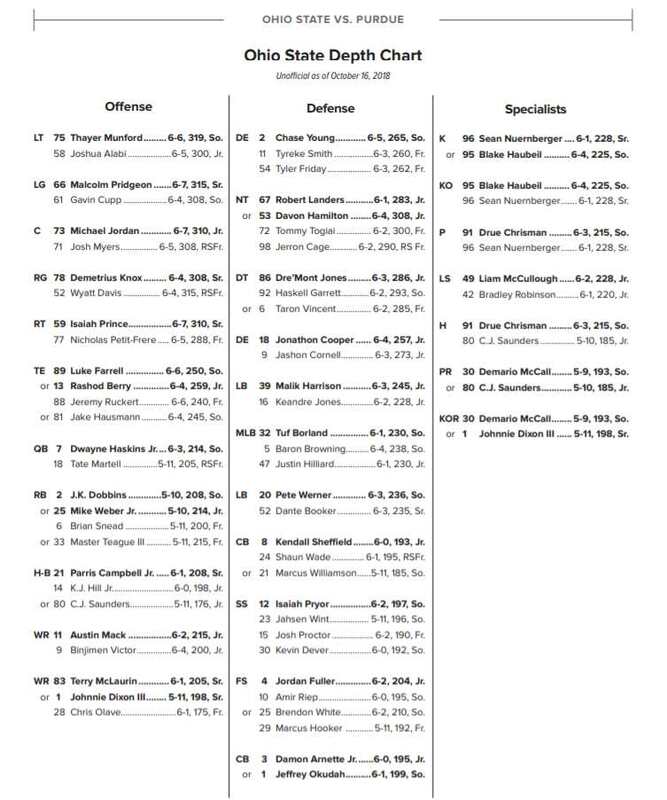 So here are a few names to know from the rest of the country. QB J.J. McCarthy from Illinois: He is the No. 19 overall player in the class and 2nd-best pro-style quarterback. DE Travion Ford from Missouri: Ford is the No. 42 player overall and 5th-best at defensive end. WR Marvin Harrison, Jr. from Pennsylvania: He is the son of the NFL Hall of Fame wide receiver. He’s ranked as the No. 51 overall player and 5th-best receiver in the class. OG Damon Payne from Michigan: Payne is rated as the top guard in the class, and No. 58 overall. QB Kyle McCord from Pennsylvania: He is teammates with Harrison, and ranks as the No. 8 pro-style passer and 113th-best player in the class. DE Jahzion Harris from New York: He’s from OSU pipeline Erasmus Hall, the same school that produced Curtis Samuel, Matthew Jones, and Jahsen Wint. He’s ranked as the No. 11 DE and 155th-best player overall.